Located along Lake Robbins Drive, west of Town Green Park and The Cynthia Woods Mitchell Pavilion, The South Regional Library has a lot to offer to book lovers of all ages. It was first opened in 1976 at the Woodlands Information Center. Thanks to donations and a grant from the Library Services and Construction Act (LSCA), the library was then moved to a brand new building in 1978 along Many Pines Street. Sadly, on January 1992 the library fell victim to arson and was badly damaged by the fire. With the $800,000 in insurance money, an additional $100,000 LSCA grant and the capable team of Ray Bailey Architects, reconstruction began on a new site. In the meantime, the South Library continued its service to the public at the Grogan’s Mill Shopping Center, housing thousands of donated books that flooded in after the fire. A little over a year after the tragedy, on February of 1993, the official ground breaking of the new South Regional Library was held and thus began the construction of the library’s new home. By May 1994, the temporary library site in Grogan’s Mill was closed in order to start moving the books and facilities to the new site. On June 13, 1994 the South Regional Library was opened to the general public. While on September 10 of the same year, the library celebrated its Grand Opening. 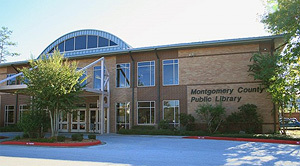 It is now the busiest library in the Montgomery County Memorial Library System, with over 100,000 books and over 70,000 library card holders. It offers computer classes, book clubs and events for all ages. Most of all, to this day it continues to provide a safe reading space for everyone from Adults to Toddlers. For more information on the South Regional Library click here. For more information on Woodlands destinations and events click here.